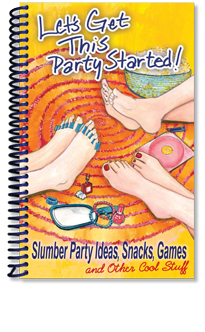 Slumber parties are full of laughter, fun foods, hilarious games and exciting activities! This book is jam-packed with ideas to help you fulfill many sleepover nights worth of these party requirements! And for your convenience, the activities, crafts and snack recipes are divided into thirteen different fun party themes (from Girls Night to Luau to Beach Party to Western Night and lots more!). And, because every party starts with a plan, there’s even a Party Planner section included. Go on, get your next party started!